The Voice of St. Louis! Charles Glenn is an entertainer who draws upon his vast wealth of knowledge and training to create unforgettable musical experiences for his audiences. Whether with his full band or a smaller ensemble, Charles can be seen around St. Louis at sporting events, charitable galas, weddings, corporate functions and clubs. The son of an accomplished opera singer, Charles received early training in voice and percussion. Charles has utilized both his strong vocal and percussion talents as the opening act for such national groups as Smokey Robinson, Huey Lewis and the News, and the Allman Brothers. Charles has also performed and worked with Andre Crouch and Stellar Award winner Calvin Bridges, and was selected to perform a series of limited engagements with Grammy Award-winning group “The Fifth Dimension”. 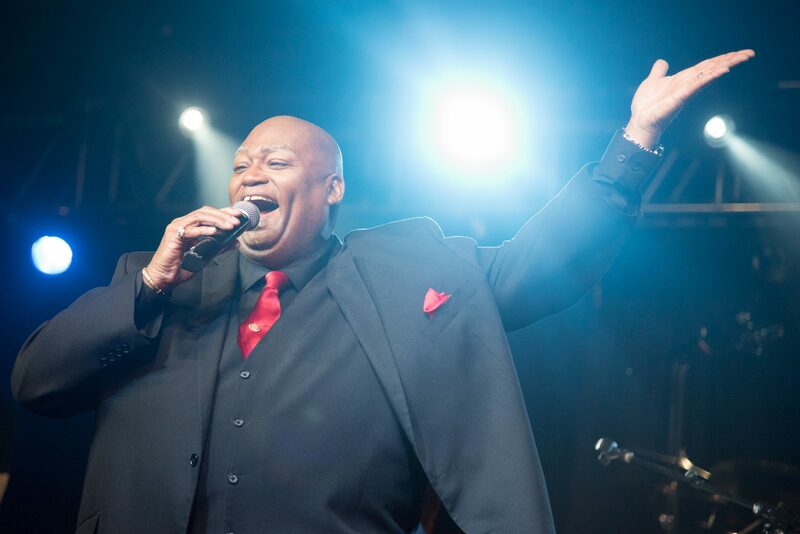 Charles Glenn has had the opportunity to perform during major grand openings for casinos in Kansas City and Las Vegas. His unique style and high spirited performances have been a highlight of many conferences and retreats for major corporations and organizations. In addition, Charles was selected by Don King Promotions to sing the National Anthem for both nationally televised Corey Spinks fights. Other than the ceremony, Charles Glenn was by far the highlight of our wedding in July. We had an 8 piece band and couldn't have been happier. I'm a music teacher and my husband is a full time musician and there was nobody else we would even consider after seeing Charles! Almost all of my husband's friends are musicians from around the country and we wanted to blow away everybody from LA to New York. Charles and his band were over the top and played music to get everybody dancing. They played everything from Earth Wind and Fire to newer songs still on the radio. They even played without taking any breaks. We had a Jewish wedding and Charles' band played the best sounding and most energetic Horah that we had ever heard as well! One of our guests was an agent with William Morris in Beverly Hills and even his jaw dropped when Charles sang Whitney Houston's "I will always Love you" EVEN BETTER THAN WHITNEY. And yes, CHARLES sings it, not the female singer (who was also fantastic!). If you want to awe your guests and have a great time look no further. It was incredibly easy to work with the band and they came fully prepared. They’re worth every penny! Charles and the band played at my daughter's wedding last weekend. I can't tell you how fabulous they were, and how many positive comments I received from our guests about their music. They were able to learn and play several special requests, and kept the dance floor filled up to the very end of the reception...even on a Sunday night!! It was so much fun to see my friends and family rockin' it on the dance floor as if we were in our teens again! Thanks to Charles and the band for sharing their amazing talents with us for Rob and Mallory's celebration. OH MY GOD. Charles Glenn and his band are INCREDIBLE!! They were rockstars and we had an amazing time with them. What a ridiculously talented group. All the guests raved about them and they really helped make our wedding memorable and outstanding. We cannot thank you enough, Charles, and the whole Contemporary Productions team for your stellar work. BOOK CHARLES TODAY!! This band was well worth the money and kept the dance floor packed all night at my wedding on 9/16/17. I am STILL getting great reviews of them from my guests. They all complimented how great the Charles Glenn Group was and I couldn't have been happier! Thank you! If I could give the Charles Glenn Group 15 stars, I would. Totally worth every penny. If you hire them, trust me you will be able to sleep well at night and worry about the other details for your wedding because this one is completely and totally amazing and taken care of from the minute you sign the contract. They were hands down the highlight of the wedding. My husband and I did not stop dancing the entire night. My uncle even asked if they had CDs they could sell! They were amazing. Truly, truly amazing.